BUFFALO, N.Y. — Roswell Park Comprehensive Cancer Center and the Buffalo Sabres are partnering to offer free prostate cancer screening for eligible men. The March 24 screening event, the first to be held as part of the One Team, One Goal: Together to Beat Cancer campaign, is part of a broader effort to reduce cancer’s impact among the team’s fans. Attendees will get a chance to tour the team’s locker room and to meet Sabres alumni including Val James, the first American-born black man to play in the National Hockey League. 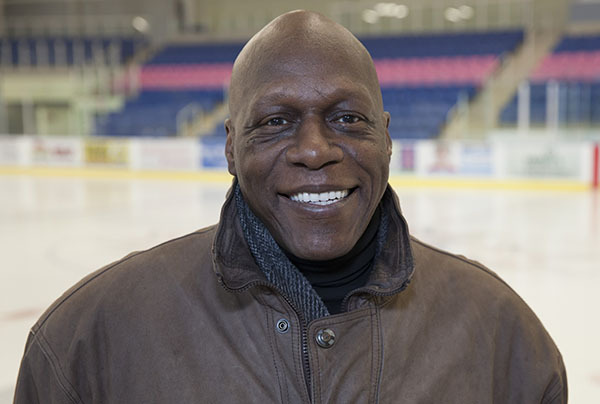 James, the author of “Black Ice: The Val James Story,” played five seasons for the Rochester Americans and suited up for the Sabres for 10 games in 1981-82. Fellow Sabres alumni Marty Biron, Craig Rivet and Rob Ray are also expected at the event. Roswell Park follows the guidelines of the National Comprehensive Cancer Network (NCCN), which recommends baseline PSA screening for all men at age 50 for men at normal risk of developing the disease, and earlier for those at high risk. By the time they reach 50 about half of American men will have cancerous prostate cells in their prostate, but the vast majority of those cancers can safely go untreated. PSA testing is currently the only proven method of monitoring prostate cancers to identify those tumors that are life-threatening — and those cancers that will not require treatment. Eligible men — those age 50 and over or others who are at least 40 and are at higher risk because of their race and/or family history of prostate cancer — will have the opportunity to get tested for prostate cancer by Roswell Park physicians. Screening only takes a few minutes, and attendees will also have the opportunity to learn about cancer risk and early detection from Roswell Park experts. Also participating in the event will be two educational partners, Men Allied for the Need to Understand Prostate Cancer (MAN UP) and the “Us Too” Prostate Cancer Support Group. Thursday, March 24, 2016, 4–6:30 p.m.
Free parking is available at the First Niagara Center ramp. Preregistration is requested. Register online at roswellpark.org/onegoal or call 1-800-ROSWELL (1-800-767-9355).